All are very welcome to join us for our next melodrama screening and discussion session. We will be showing Victim (1961, Basil Dearden, 96 mins) on Wednesday the 6th of March, 5-7pm, Jarman 6. Victim stars Dirk Bogarde as barrister Melville Farr, a man whose apparently happy marriage to Laura (Sylvia Syms) and professional reputation are jeopardised when a compromising photograph of him comforting a young man is exploited for criminal purposes. The film’s concern with male homosexuality at a time when this was illegal in the UK made it controversial with contemporary audiences (including the British Board of Film Censors) and its bravery for tackling the subject is still recognised today. US trade paper Variety described the film as both ‘thriller-drama’ and ‘social probe’ (6th September 1961, p. 6 ). It also applauds the fact that the film lacks ‘sensationalisation of the homosexual problem’. It will be useful to assess whether we concur with this assessment in the current day, and how this fits with a view of melodrama privileging exaggeration and excess. 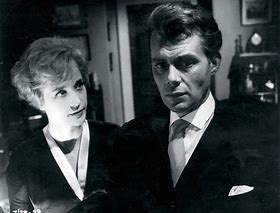 This entry was posted in Screening and Discussion and tagged Basil Dearden, Dirk Bogarde, Melodrama, Screening and Discussion, Sylvia Syms, Variety, Victim (1961) by melodramaresearchgroup. Bookmark the permalink.